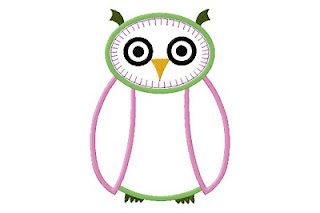 Big Dreams Embroidery: WISE OWL ...he's gorgeous! My WISE OWL is finally on Etsy. It's taken a while but I had to make sure he was perfect. He's only US$2.95 and this gets you two different sizes - 4x4 and 5x7 as well as detailed step-by-step instructions. Have a look at the photos. As you can see, using different fabric and thread colors you end up with two very different Owls. This owl would look wonderful on a t-shirt or on bed linen - you name it. The possibilities are endless. My next project is a bird with a long tail. I'm calling her Wilhelmina Wagtail. I've always liked the name Wilhelmina. An oldie but a goodie! I'll be back in a few days to introduce you to Wilhelmina Wagtail.